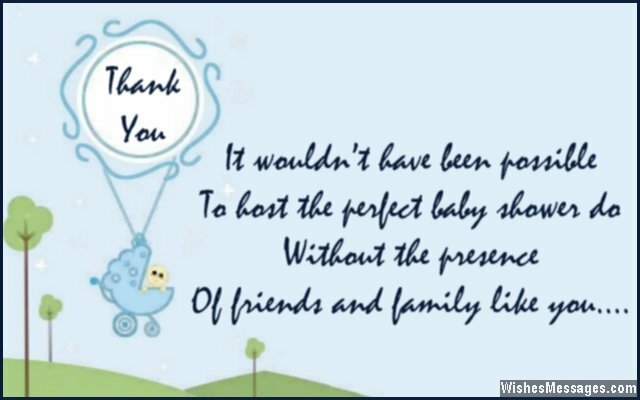 Thank You Messages for Baby Shower Gifts: Did all your friends and family shower you with the best of wishes and the loveliest of gifts? From cute handwritten notes to the sweetest posts on Facebook, send your thanks to everyone who graced the event and helped you feel like a glowing expectant mother. 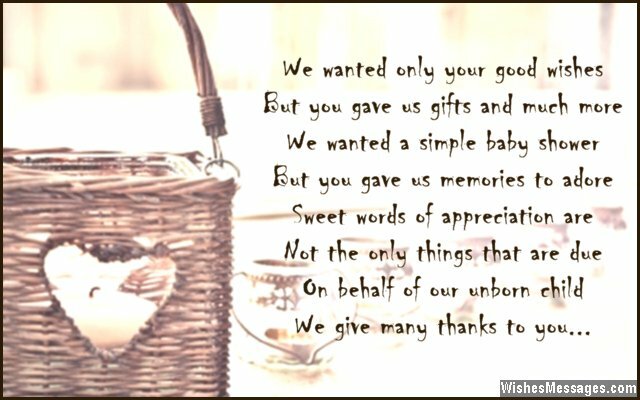 Take ideas from this post to craft meaningful little quotes to say thanks to everyone who showered you and your baby with not just gifts, but with blessings, wishes and luck. 1) We wanted only your good wishes but you gave us gifts and much more. We wanted a simple baby shower but you gave us memories to adore. Sweet words of appreciation are not the only things that are due. On behalf of our unborn child, we give many thanks to you. 2) From inside my tummy, my baby is saying boo boo. But what that really means is to say thank you. 3) Your beautiful gift makes me want to switch places with the baby inside my tummy. Thanks a lot. 4) Some babies are born with a silver spoon, but your precious gift made me realize that mine will be born with a golden ladle. Thank you. 5) Your baby booties are the cutest. They will help our little one take large strides in life. Thanks. 6) Our celebration was called baby shower and you literally showered us with baby gift. Thanks so much. 7) I could feel the baby kick inside my tummy with joy, as soon as I opened the lovely toys. Thanks for your gift. 8) You got such a lovely gift. You are the first person on the meeting list when my baby learns to say thanks. 9) Everyone is buying gifts for the baby in their own way. Thanks for giving me a gift certificate and letting my have my say. 10) Your gifts will be the perfect way to welcome my baby into this world. Thanks. 11) Your thoughtful baby gifts will make our lives easier. But moreover, your blessings will make our lives richer. Thanks. 12) Pregnancy is a crazy ride but I feel happy knowing that friends and family like you are by my side all the time. Thanks for your lovely gift. 13) Your gift is symbolic of the fact that you will continue to shower my baby with love, care and affection for a lifetime. Thanks. 14) Your gift is the personification of how I want my child to grow up and be like – thoughtful, kind and generous. Thanks. 15) My unborn baby can’t wait to take a selfie with you while wearing the cute onesie that you got as a gift. Thanks. 16) It wouldn’t have been possible, to host the perfect baby shower do…. without the presence of friends and family like you. Thank you. 17) The toys that you gave are as pretty, vibrant and delightful as the aunt you are going to be. Thanks. 18) A safe baby, relieved mom and a stress free dad – that’s what your baby monitor is going to help us all become. Thanks. 19) Just like how your comfy baby blanket will cocoon my child from cold nights and windy days, your wishes and prayers will always cocoon my child from the storms of life. Thank you. 20) A ribbon tied to your head would have been perfect, for your presence at the shower was my baby’s best gift ever. Thanks. 21) Teethers, rattles, wind chimes and toys, your gift will be loved by my baby boy. Thanks. 22) My baby is kicking my tummy hard because he can’t wait to come out and lay his hands on your amazing gift. Thank you. 23) My unborn baby will love the gifts that you got, but not as much as the person who gave them. Thanks. 24) Diapers of all types, blankets of all sizes and wipes of all materials – your baby shower gifts are as practical and sensible as you are. Thanks. 25) Thanks for all the gifts you gave me on my baby shower. I am certain that your blessings will forever be with my little flower. 26) My baby shower has been made special with your presence, because you have made it a wonderful experience. Thanks for showering your blessings in such abundance. 27) I hope that your baby stroller puts wheels underneath all the dreams I have for my child. Thanks. 28) My baby will feel like a royal upon birth, thanks to your gift which is priceless in worth. 29) Your beautiful diaper bag is on its way to be a proud replacement to my leather purse for the next two years. Thanks. 30) Everyone can pick gifts from the registry… but you went one step further and gave your unconditional love to the family and the baby. Thanks. 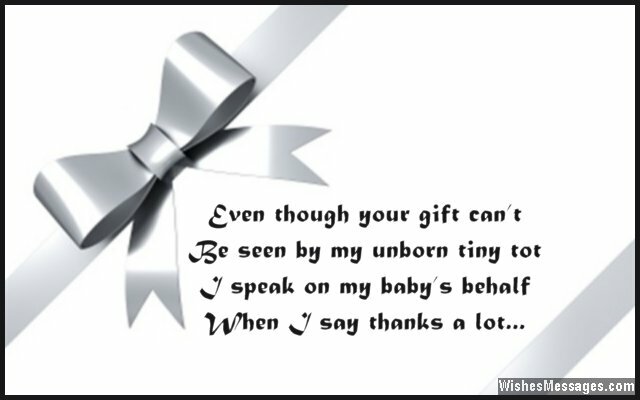 31) Even though your gift can’t be seen by my unborn tiny tot, I speak on my baby’s behalf when I say thanks a lot. On my baby shower, most guests gave me baby things. But you contributed to my baby college’s fund and gave her wings. Thanks so much. Thanks for weaving love and warmth through every warp and weft of your handmade baby bib. My little bundle of joy will be born into this world surrounded by lovely gifts like yours. Thanks. Your gifts mark the beginning of the many wonderful blessings that friends and family will shower on my child for a lifetime. Thanks.